If you love carrot cake, you are going to love this recipe for gluten free carrot cake cupcakes! These cupcakes have a homemade cream cheese frosting that is as good as your grandma’s! This post originally was posted on my Grandma’s Gluten Free Recipes blog. I didn’t realize how time-consuming two blogs would be, and I finally merged my two blogs together. One of my favorite posts are these moist gluten free carrot cake cupcakes. Carrot cake cupcakes are a type of cupcake that you can make all year long. 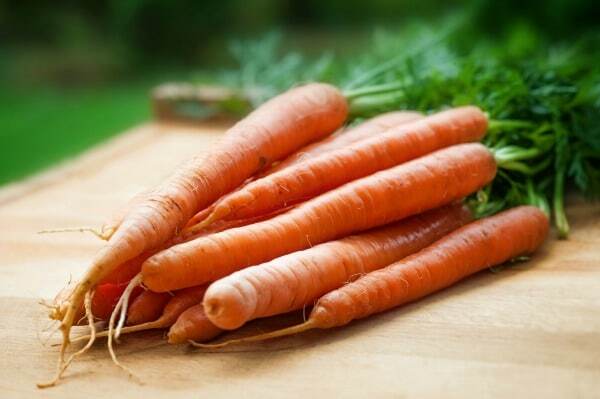 Carrots are always available, and they add some healthy stuff into your dessert without tasting healthy. These cupcakes have a thick and creamy cream cheese frosting that tastes so good on these carrot cupcakes!! I ate two and will have to run an extra mile or two to lessen my guilt! :-). Here are a couple of my favorite cupcake recipes on Fearless Dining for you to also try: Gluten Free Lemon Cupcakes with a Lemonade Drizzle and these Gluten Free Chocolate Cupcakes. Don’t you wish you could take a bite out of this gluten free carrot cupcake? If you love carrot cake, this delicious Gluten Free Carrot Layer Cake makes an incredible birthday cake! This cake is more light and fluffy and cake-like, where these cupcakes are a lot more nutrient dense. The hero of this recipe is the big bunch of organic carrots I found at our farmer’s market this week. I love when they have those big plumes of carrot greens on top. Their freshness really shows through in this recipe. This recipe is pretty healthy, well, if you don’t count the cream cheese frosting. You can easily make them healthier if you like. We have made this recipe for years and I have adapted these for many different occasions. Add 2 tablespoons of ground flaxseed meal. Add more almond flour (1 cup gluten free flour blend to 1 cup almond flour). You may need to reduce the liquids to 2/3 cup almond milk and 1/4 cup coconut oil. As you can see, this cupcake is super moist. (I added chia seeds!) I also grated my carrot pretty thickly. I wasn’t trying to hide veggies from my kids, so I just used the larger-sized grater section. Add all of your dry ingredients into a large bowl. Whisk to blend. Add in your wet ingredients and shredded carrots. Mix well. After mixing the ingredients, you will have a semi-thick gluten free carrot cake batter, like in the picture. How long do you bake carrot cupcakes? Place paper liners into a muffin tin and fill each cup with the cupcake batter. Bake at 350 degrees for 20-25 minutes until done. Remove the cupcakes to a cooling rack. Make the frosting by adding the cream cheese, powdered sugar, vanilla, and butter to a mixer. Mix until the frosting is fluffy. Add it to a pastry bag and squeeze the frosting onto each cupcake. Sprinkle with unsweetened shredded coconut and enjoy! Can you make this carrot cake recipe dairy-free? You can definitely make this gluten free cupcake recipe dairy free. You can use a dairy-free cream cheese like Daiya or Kite Hill to make the frosting. My favorite gluten free flour blend. If your blend doesn’t contain xanthan gum, don’t forget to add a teaspoon! An easy gluten free carrot cake cupcake recipe with a cream cheese frosting. In a large bowl, add all of the dry ingredients and whisk to blend. Grate carrots with a grater, or a food processor. Add wet ingredients to a bowl. Mix well then add carrots and mix to blend. Add paper cupcake liners to a muffin tin and fill each 3/4 with the cake batter. Remove from the oven and take cupcakes out of the muffin tin. Put them on a cooling rack and allow them to cool all of the way. In a mixer, add all frosting ingredients and mix until fluffy. Put the frosting into a frosting bag and squeeze the frosting out onto each cupcake. *Optional: sprinkle coconut on top of each cupcake. I modified these to be muffins rather than cupcakes – 2-1/4 C flour, 2/3 C sugar + some Stevia, 2 t baking powder and skipped the apple sauce because I didn’t have any. They turned out beautifully – light pleasant texture and I love the little pops from the chia seeds! Yummy with cream cheese for breakfast. I love that you made this recipe even better Dorothy. Thank you so much for sharing how you modified it to help other readers. I’m not sure what I love more, the frosting or the cupcake! They both look lovely! Anything with cream cheese frosting and I’m sold. I’ll definitely be trying this alternative, thanks so much!